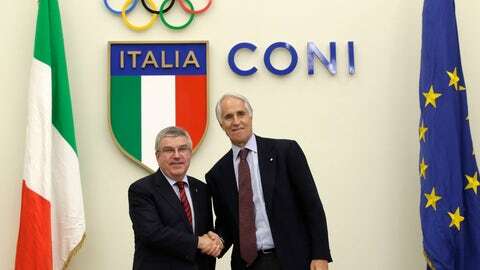 ROME (AP) — IOC President Thomas Bach gave his blessing Thursday for the joint Milan-Cortina d’Ampezzo bid for the 2026 Winter Olympics to move forward without funding from the Italian government. Funding from federal governments has always been one of the keys for Olympic bids but Agenda 2020, Bach’s wide-ranging reform package passed in 2014, allows for more flexible rules. Lombardy and Veneto are two of Italy’s most affluent regions. Calgary’s town council voted in favor of its bid this week but on condition that it can secure satisfactory funding to cover operational costs of the games. “Clearly finding a solution to this issue has taken precedent over everything else,” CONI president Giovanni Malago said.